Khonaysser Group is a lebanese company established in 1960 for servicing diesel engines and trucks. 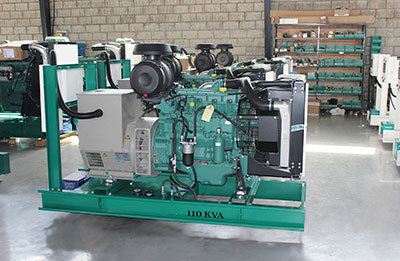 Nowadays, we are leaders in supplying diesel engines for Industrial and Marine commercial/Leisure applications. Our industrial and Marine scope of supply covers a wide range of diesel engines & generating sets 50hz/60hz/400hz, customized packages, sound proofing, switchgear, synchronizing panels, genuine parts, local and international after-market support. Complete solutions and aftermarket services are the key of success in industrial and Marine segment; Khonaysser Group is able to offer high end products, global support for applications covering diesel-operated power generating sets and versatile applications including but not limited to, container handling equipment’s and different kind of forklifts. 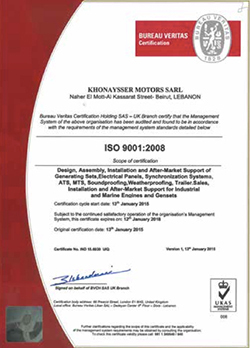 Khonaysser Group is committed to operate according to the applicable legal requirements, ISO 9001:2008 requirements, conducting continual improvement in the organization, and working according to quality policy and quality objectives.